If you missed last week’s episode, check it out here. This week starts with Cooper heading to the President’s office. He begs the President to stop the execution, because he says that Reddington knows and can find who the assassin is. Cooper says if he doesn’t, he will tell his German allies that Zeigler’s death was on the U.S., which would be very problematic. After Cooper threatens the President with this action, we head to the execution room where the warden is about to give the word for the nurses to push the injection. He asks Red if he has any last words, and he says that he will save his words for the next life. All of a sudden, the red phone rings. The President stops the execution. Liz calls Ressler, Samar, and Aram, telling them that the President called off the execution. Cooper and Anna McMahon are in the White House as she explains his execution is on stay for 48 hours to find the assassin or he will be executed. Red is on FaceTime and tells Harold that if the agreement is to his standards, he agrees as well. Red has to wear an ankle monitor and McMahon and Cooper know his whereabouts. If he escapes or kills anybody, Cooper will be charged for aiding and abetting a fugitive. Anna tells the President that he has nothing to worry about and that they should have the dossier within the hour. He says that 48 hours is a long time for Reddington to figure out everything. At the prison, the warden says that Red is a lucky man. Red walks out of prison as Dembe and Liz are there, and they exchange hugs. Red reveals he has no idea how to find the assassin and doesn’t know where to start, but he needed to bluff in order to save his life. They arrive at the Task Force, and Red explains how they all helped gather information for the conspiracy, the R.A.T, the Cryptobanker, the bug scientist and more. They are all connected. Red says that Moreau is the one who killed Ziegler, but they need to find him. They look up a list of everyone at the UN bombing, and Red looks at the list and says that Moreau’s next target is Christopher Miles, a former agent who would have a dossier worth killing for. Miles takes Moreau to his apartment and gets him the dossier, but Moreau shoots him in the leg, making sure he isn’t lying about no other copies of the dossier. Meanwhile, Red shows up and interrupts a game night for information on how to find Christopher Miles. The man is concerned about Miles, but Red says he means him no harm, but he will hurt anyone that gets in his way. Dembe wastes time and plays a game with the other guests as they sit, terrified. Anna orders Moreau that Reddington needs to be dealt with. Ressler and Navabi show up to the apartment and storm in. Navabi is experiencing some sensory overload with the lights, and suddenly she sees Moreau with Miles. Moreau shoots at Navabi then shoots Miles and runs out the fire escape. Ressler runs after him as Navabi holds Miles in her arms. Miles tells her the password for the dossier — it’s “Fox Glove,” and he dies. Liz calls Red and says they don’t have anything as Moreau was given direction by Anna to take out Reddington because he knows too much. Moreau shows up to the restaurant where Dembe and Red are eating, and Red asks him how he knew he was there. Red puts it together and knows that Anna told him. He said that she has misled him and by opening the dossier with the password he can provide, he will know the truth. Moreau reads it and knows the truth; he spares Reddington’s life. Reddington calls Liz and tells her that Moreau’s next target is Anna McMahon. Moreau calls McMahon and says he left it at a place where it could be picked up. Moreau waits at the bus station and sees the courier pick up the dossier. He follows her to Anna’s house, and he stabs her in the stomach. Anna gets home to find Moreau in her house and the messenger dead. Moreau says that he knows that she lied and that she is a part of a plan to hurt the United States. Suddenly, Liz and Ressler arrive, and Anna maintains that she doesn’t know anything and didn’t see his face. Moreau escapes and puts the dossier in a backpack of a child as he is arrested. As Ressler is about to handcuff him, Moreau is executed and shot from the north. The assassin was a body guard for the President. Aram finds Samar smoking on top of a building as she deals with the guilt of Miles’s death and her symptoms. She decides that it is time to tell Cooper the truth. Aram assures her that everything is going to be okay. Red is now able to walk free from prison because the assassin was captured, but killed. Anna reinstates the immunity agreement, but she is overseeing the Task Force now. 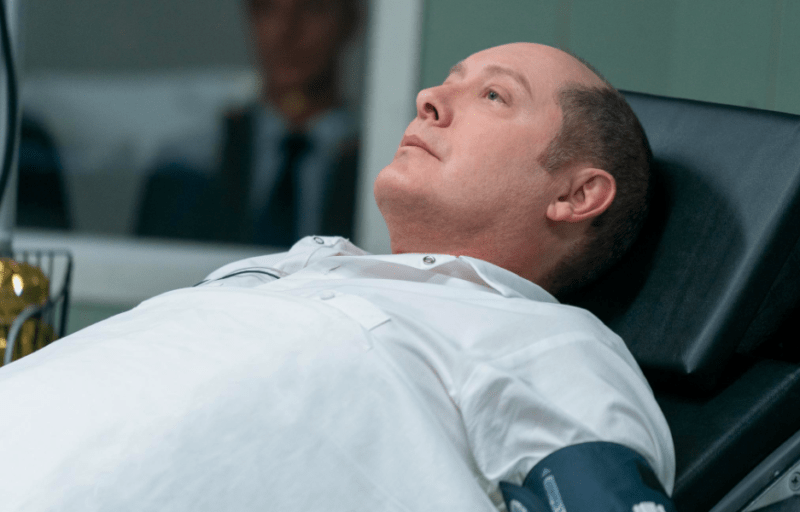 Reddington is now a fugitive again as they put the story out on the news that he escaped prison, so the public doesn’t know about the immunity agreement being reinstated. They agree, and the team celebrates the rescue of Reddington. Reddington explains that Anna must have a connection, and in order to still investigate the conspiracy, they are going to have to work behind her back. Anna tells the President that Moreau was killed, and as far as they know, he never told anybody what was on the dossier — but now it is missing. Ressler and Keen have a chat that she decided not to tell Red about what she did, and she hopes that Ressler will also let it go. Samar goes to Cooper’s office and tells him that she is resigning but doesn’t say why. She loved working there, but she says that it’s time, and she gives Cooper a hug. Previous story ‘RuPaul’s Drag Race’ Season 11, Episode Four Recap: Can We Retire the Term “Rusical”?